how many amazing bloggers at one place! Love that top and white jeans. Looks fab on you! Happy Memorial Day weekend. All these outfits are super cute! So cool she featured yours from yesterday I must say it's still my favorite out of all of those! I love these posts! It gives me a chance to check out some blogs I've never read before! Love that polka dot top, so fun for summer! Love this! With your new white skinny jeans! Have you become obsessed with them yet? Oh...your navy top!! I need that EXACT one!! I love that polka-dotted top. It's gorgeous! I love the pink and green combination with the leopard shoes! Always such a fun accessory, leopard is. Great post and happy Friday! GREAT shares this week! can't wait to check them out!!!! COOLEST LIST!! great way to share and spread the word. 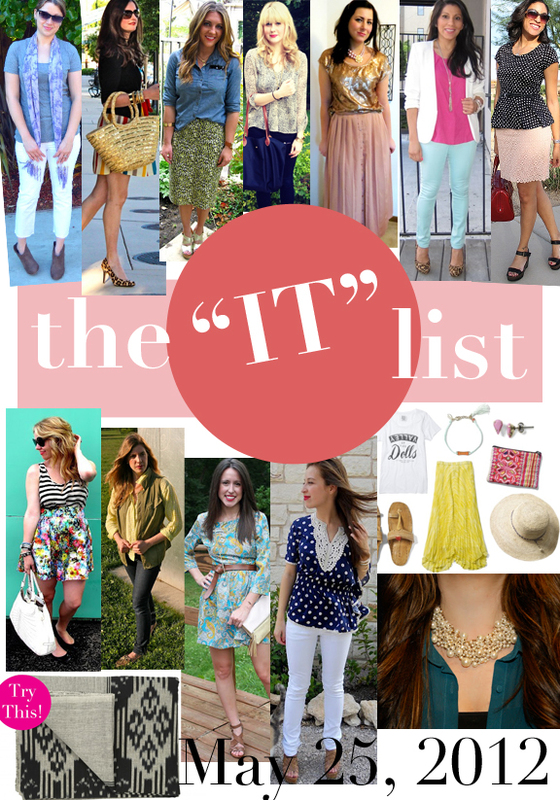 Love the It list posts, they are always so inspiring and full of great style! Haha, way to join the white jeans skinnies club. I need to join too! Gah! So many things to check out :) can't wait. Love the list!! and the style of everyone!!! Polka dot peplum is so chic! congrats on making the it list!! Yay for the It list that is awesome!